The Car Top Duffle Bag is made from our durable PVC Coated Mesh, a polyester re-enforced PVC. The material is a little stiffer than our PVC Mesh and helps the duffle bag maintain its shape when thrown over your shoulder or carried by hand. The polyester grid inside the material makes it resistant to tears or cuts. 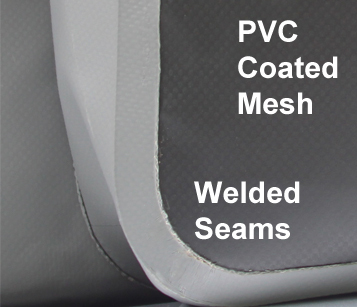 PVC Coated Mesh is great for cargo bag applications as it can be welded together to form a watertight seam. PVC Coated Mesh withstands extremely hot or cold temperatures. It is rated at UPF50 for UV protection which means it blocks 98% of the sun’s harmful rays. The attractive gray and black colors will not fade over time. All of our logos are screen printed on the material and sealed in place. PVC Coated Mesh will handle the rigors of the frequent use this bag is likely to receive.